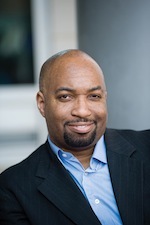 Josh Bell, the narrator of Kwame Alexander’s novel, The Crossover (book from Houghton Mifflin, audio from Recorded Books) defines it as “a basketball move in which a player dribbles the ball quickly from one hand to the other.” This move, sudden and surprising, also describes the book’s dramatic change in success. The sudden surprise of crossovers is there in style as well. Alexander changes pacing and mood frequently, creating continual musical counterpoints in the poems’ arrangement. One describes action on the court with vibrant verbs that whip along. Soon follows a shorter, more thoughtful poem that gives readers pause. When Alexander listens to other writers, his tastes cross genres–from the suspense of Dean Koontz and John Grisham to the spirituality of Deepak Chopra audiobooks. And, of course, he listens to lots of poetry, including the work of his teacher and mentor, Nikki Giovanni, and the poems of Li-Young Lee. In THE CROSSOVER, Alexander’s awareness of sound is clear in his characters’ lyrical dialogues. Trash talk on the court yields quickly to tender, quiet moments. The voices of Josh’s loving parents form a distinctive balance. His father speaks with verve and humor; his mother’s dialogue is quieter, more controlled. The book has brought Alexander himself several surprises. One of those occurred as he wrote the startling ending. “I cried as I wrote it; I still do when I read it. It wrote itself into the book; it wasn’t part of the plan.” Until the book’s publication he didn’t realize he’d gone from visiting his father in the hospital after his heart attacks to a nearby café where he wrote.